On their bandcamp page, duo Malik Manifesto has the phrase “real is ‘relative,’ truth is ‘absolute. '” The motto appears to be a fitting explanation to Malik Manifesto’s debut, self-titled album. 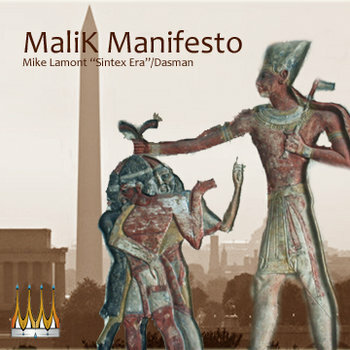 Consisting of producer Dasman and MC Mike Lamont, aka “Sintex Era,” Malik Manifesto’s album begins with what Lamont calls “the king’s manifest,” a title for that a large entity (ex government, big business), something that can hold and affect all of our multiple realities as mentioned in the “Intro” or like in the album cover. This album stands out due to Dasman’s jazz and soul sampling sound, and Lamont’s laidback, effortless flow and intriguing lyrics that are reminiscent of the golden era of hip-hop, like Erik B and Rakim and De La Soul. An accountant by day and rapper by night, Lamont rapping in “To the Aether” (“to the aether, feel my soul coming out through the speaker”) and “9to5er” speaks about the at times conflicting identities of his life that are throughout the album. “Reveal” features rappers MORris Done and Opio of Hieroglyphics, one of the rap groups from the 90s that should have received more attention, and not only tells but shows a needs for more creative hip-hop. The lyrics to “Scumbaggery” fits the title as if Lamont takes on another persona, yet you can’t help but bang your head to Dasman’s trumpet and beat production and Lamont’s more hard-hitting flow. In “Anecdote,” which samples The Last Poets’ “E Pluribus Unum,” Lamont expresses his prowess as a lyricist as one that is actually saying something different, also expressed in other records, like “Mindspray,” and “Voodoo.” Back to the concept of “king’s manifest” the songs, “Appreciation” and “Know No Better,” presents hip-hop as a different bigger than life force that controls him (the latter is kind of similar to the themes in calypso singer Shadow’s “Bassman“). Lastly, I must commend a guy who is at least not intimidated by an intelligent female whose not afraid to challenge him (“Smart Chick”). Given the reputation of mainstream hip-hop today, Malik Manifesto gives a refreshing listen in a sea full of throwaways.